Saturday, May 24 was the last appearance for the original lineup of the band Nero. It was an all ages show at the Methodist Church on Main Street in Newark to benefit the Trap Door Theater Company. The band played more all ages shows and benefits than bars, keeping their audience more diverse and widespread. Often called a thinking person’s band, vocalist Monika, drummer Jeremy and guitarist Joe began playing and writing together four years ago, under the curious heading of Obese Pharaohs of Funk. Late in ‘95 they sought out new bass player Larry, and adopted that banner of things dark and decadent, Nero. The band has released three independent 7” singles, as well as their own full length CD (Sanguine). They’re also on a few compilations such as Switch Skate Shops Switchstance, WVUD’s Scare Your Roommate and Zowie Records The Rosetta Stone. Nero appeared in several music showcases in Philly. They also played West Chester, PA and dates in NJ, MD, And DC. Arguably the hardest local band to squeeze into one category, and unique on many levels, Nero synced together lyrics that conjured up images of Edgar Allen Poe stories, complex but primal rhythms and a guitar sound drawn from rockabilly, funk and soul. They played with bands from one end of the spectrum to another -schroeder, Black Light Rainbow, Zen Guerrilla and The Reach Around Rodeo Clowns. They leave behind a lot of fans and the memory of a band with a singular style that’ll take a while before the echoes fade out for good. Best to the band, and thanks to everyone who supported them. Nero was an alternative rock band from Newark, Delaware who were around from 1993 until 1997. They originally started playing shows as the Obese Pharaohs of of Funk, releasing two 7 inch singles – the self released Matlock (b/w The Last Time I Laughed & Mel’s Song) and Pumpernickel (b/w Squeeze the White Ball) on Neck Records. 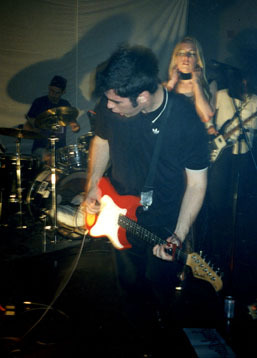 Bassist Larry Zappaterrini joined the band in 1995, prompting a name change to Nero after signing to Zowie records. They released their only full length record, Sanguine, in 1996, as well as a final single, Soul Mint (b/w Sparkler), in 1997. They played shows throughout Delaware, Washington DC, Philadelphia and New Jersey, sharing the stage with bands such as El Guapo, My Life in Rain, Black Light Rainbow, The Better Automatic, schroeder, walleye, jake and the stiffs, the joypoppers, The Goats and many others.